During this year’s Autumn Budget Statement, Chancellor Philip Hammond declared, ‘Britain is at the forefront of a technological revolution.’ Cutting-edge technology was indeed a major benefactor of this year’s investment pot, with government plans to invest over £500 million in a range of sectors, from artificial intelligence to 5G and full fibre broadband, in 2018 alone. Driverless vehicle technology will also benefit, with a new £400 million charging infrastructure fund, an extra £100 million in the Plug-In Car Grant, and £40 million in rapid charging. In his speech, the chancellor said that the government are ‘investing in Britain’s future’ with the biggest increase in science and innovation funding in 4 decades. He unveiled a 10-year action plan to unlock over £20 billion of ‘patient’ (‘long-term’) investment to finance growth in innovative firms through new investment into funds, clarified pensions guidance and reform of tax reliefs. The Chancellor also promised a further £2.3 billion for investment in R&D and an increase in the main R&D tax credit from 11% to 12%, a move which he confirmed would be the ‘first strides towards the ambition of our Industrial Strategy to drive up R&D investment across the economy to 2.4% of GDP.’ Currently under 2%, the UK’s R&D spending (as a percentage of GDP) still lags behind that of many other advanced economies such as South Korea, Israel, Sweden and Finland, which contribute more than 3% of their GDP to R&D. This Industrial Strategy, launched in November 2017 by Business Secretary Greg Clark, demonstrates that the government has ambitious plans to make ‘the UK the world’s most innovative nation by 2030.’ To achieve this, a further £725 million over the next 3 years is pledged in the Industrial Strategy Challenge Fund (ISCF) to respond to some of the greatest global challenges. The white paper also confirms that the government will be pressing ahead with a series of “sector deals” – partnerships between the government and industry on sector-specific issues. Construction, the life sciences, the automotive industry and artificial intelligence will be the first to benefit from these new strategic partnerships with government, backed by private sector co-investment. New funding calls have already been published following the announcement. A new tech business is founded in the UK every hour; the Chancellor wants that to be every half hour. What Does the Budget Statement Mean for Your Tech Business? 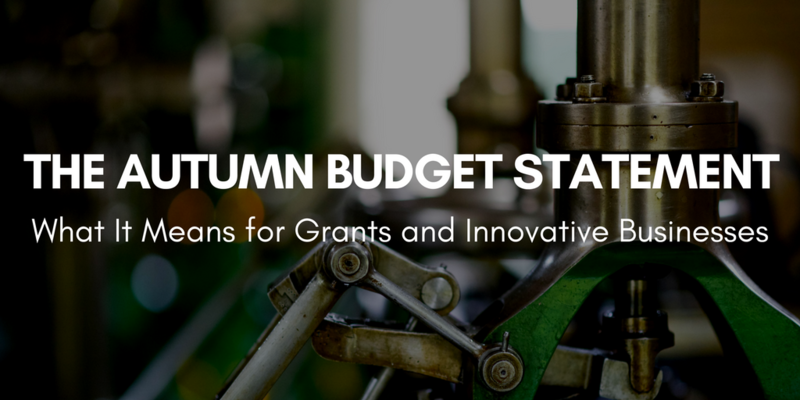 The directors at Granted Consultancy, who have worked in the R&D grant sector for over 10 years, believe that the budget is a clear indication that if your business is innovating, there is support for you in the form of grant funding. The R&D grant budget is increasing almost 5-fold to 2021, and conversations we are having with directors at the EU H2020 programme confirm that the UK are taking part in scoping conversations for the next round of EU R&D grant funding. The intent is clear – use R&D grant funding to support the UK’s high potential innovative companies so that we can export our way out of this Brexit-induced economic slump. Watch the Granted website for a flurry of funding calls in the next few months. The budget is always a bottleneck for funding announcements, and this year should be no different. Meet Granted and other business service providers – as well as funders, startups, and more – at the flagship Business Funding Show 2018. The event will be held on 22nd February 2018 (9 a.m. – 9 p.m.) at London’s East Wintergarden. Learn more and secure your ticket now.